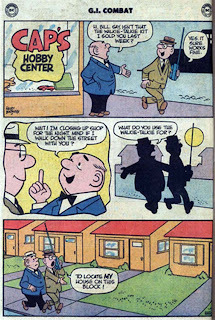 Cap's Hobby Hints was a sweet little strip that ran in most DC comics from the '60's to, I'm guessing, the early '70's. 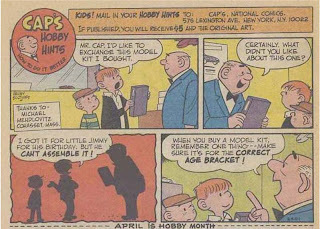 I remember it vividly, and as there was no access to back issues at that time, it's safe to assume the strips I remember must have appeared round about '69-'72. 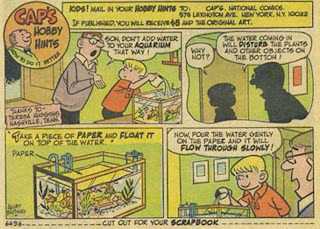 They were written & drawn by Henry Boltinoff, brother of DC editor Murray Boltinoff, illustrated in a wonderfully old fashioned style for the hip & groovy '70's, and were just about the most charming thing in comics. Gee, thanks, Dad. I was actually trying to kill the fish. Why don't you mind your own beeswax? Anyway, Boltinoff was another one of those cartoonists who made it look easy. 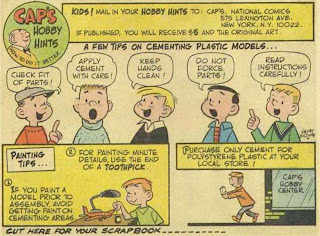 He was a genius at drawing kids, and as for Mr. Cap himself, he made the advice-dispensing shopkeeper the definitive jolly, avuncular grown-up. You just knew there was a sweet little old Mrs. Cap back at home, happily baking cakes and organizing church socials. 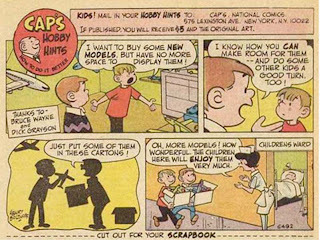 Unfortunately their marriage wasn't blessed with children, which was why Mr. Cap liked having the neighbourhood kids around in the first place. Ok, maybe I am reading too much into it now. 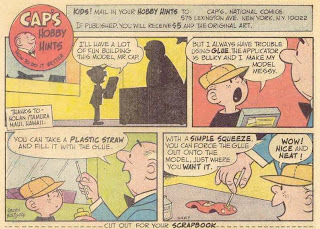 Hands up, I was never into model-making. It just seemed like a waste of money I could be spending on comics. 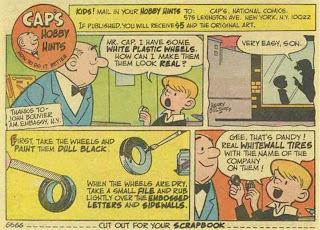 But I always liked Cap's Hobby Hints. 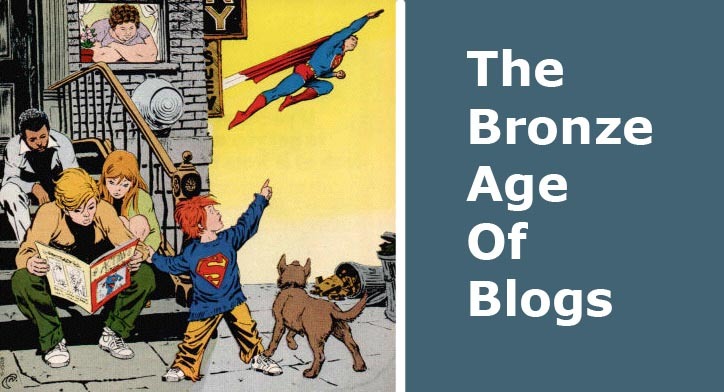 It was a safe, reliable, gentle world that kids liked. 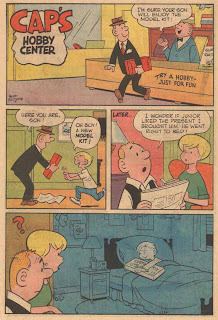 It spun out of, I guess, this more gag centered strip, Cap's Hobby Center. Whichever one you prefer would obviously depend on your age. That last one's quite interesting historically. 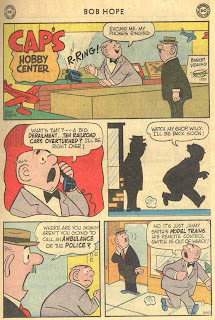 Suburbia must've been a very recent thing for Boltinoff to make a gag out of it. Seems unbelievable now, doesn't it? It really stinks all of the comments are worthless spam bots. 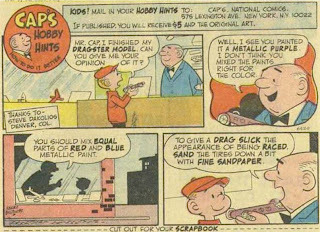 Your blog is great and it's really neat to see so many Cap's Hobby hints in one spot. Thanks! Agreed with Spathington. Really cool stuff here and it deserves better comments. I love comics. What else d'you need? Love comics? Seen the movies and want to know more? You're in the right place. Action Presents: Kids Rule OK! The Leopard From Lime St.
All images on this blog are, natch, copyright the respective creators / publishers. This is a non-profit site, just to let fellow fans see stuff I like. If I've posted anything that's yours, and you want acknowledgement, just let me know. Equally, if it's yours, and you don't want me to post it, let me know, and of course I'll take it off. And if you've come here to read and talk comics, glad to have you aboard. If however, you're here to spam or advertise your scuba gear website, you're wasting your time, as your comments will be deleted the second I see them.